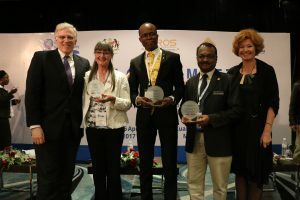 On 12 April 2019, the FedEx Road Safety Awards will be presented to three member NGOs of the Global Alliance of NGOs for Road Safety (the Alliance) that exemplify the values of the Alliance and have demonstrated growth and exceptional dedication to road safety. This year, Alliance members are invited to nominate fellow member NGOs for the award. Tell us, which NGO in the Alliance community is your road safety role model? Which organization has demonstrated unwavering commitment to road safety and/or post-crash care and achieved results that make a difference through its advocacy? Which organization has invested time in the life of the Alliance and its fellow members to strengthen the NGO road safety community? Which organization has demonstrated a willingness to learn and seek out best practices, learning from others and putting what it learns into practice? The deadline for nominations is 5 March 2019. You cannot self-nominate and only Alliance members can be nominated or make a nomination. Submit your nomination HERE or via the button below. All nominations will be verified by the Alliance Secretariat. The Secretariat may also nominate additional NGOs. Nominations will be presented to a selection committee made up of Alliance Board Members and FedEx representatives. Additional information may be sought if necessary. Commitment: The award is given to an Alliance member NGO that shows commitment to road safety and/or post-crash response over a period of time. This would be shown in terms of years of active implementation of programs or advocacy for road safety and increased engagement in actively advocating for improved road safety conditions. Commitment is also seen as having been able to gain commitment for advocacy and thereby see the fruits of its work. Involvement: The award is given to an Alliance member NGO that has demonstrated active involvement with the Alliance and has contributed positively to advancing the Alliance mission. Examples of collaboration could be: supporting the secretariat in improving the range of offerings or the quality of the Alliance work in benefit of its members, but also activity engaging in social media. Learning: The award is given to an Alliance member NGO that has demonstrated a willingness to learn. This could be demonstrated by seeking advice or engaging with fellow members, applying best practices, or seeking out practices or knowledge from others. It could be facilitated through the Alliance capacity building initiatives or by actively sought out through opportunities outside the Alliance. For the past decades FedEx has played a leading role in supporting improving road safety efforts around the world. FedEx has established this award to recognize the achievements and commitment of Alliance member NGOs to road safety globally. Every other year, most outstanding nongovernmental organizations, are recognized through the award. The award is organized and managed by the Global Alliance of NGOs for Road Safety whose member organizations can be nominated for the award based on specific criteria aligned with the Alliance mission. The organizations are celebrated for their growth and exceptional dedication to road safety and given public recognition at the award ceremony. You can make a nomination in English, French, or Spanish.